LEAD Prayana a leadership journey to unleash leadership potential, from January 23rd to February 7th with 137 college students from throughout the country traveled across Karnataka and part of Telangana and Andhra Pradesh interacting with role models and experienced speakers and expose with their remarkable work. As the LEAD Prayana tagline suggests, students became inspired in order to unleash their leadership potential through exposure to individuals and institutions that have innovated and implemented solutions to major challenges. Through this leadership journey on wheels, the LEAD Program aims to build in youth the need to bring a change through effective leadership. Throughout the 16 day journey, the Prayana students traveled 1,800 km to interact with more than 20 role models and speakers throughout 9 locations. 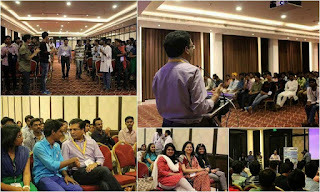 Each day was full of excitement, enjoyment and learning to ensure that Prayana participants kept their energy high. Students started their journey at VTU in Belgaum. After, the students completed their registration process; they spent the day learning about VTU and its impressive efforts. The day ended with cultural programs. Next day , the flag off ceremony was hosted by Chief Guest Mr. Vivek Pawar (Founder of Sankalp Semiconductor), Guest of Honor as Naveen Jha (CEO of Deshpande Foundation), Mr. Ajay Suman (Functional Head of LEAD and LEAD Prayana) and Dr. H. Maheshappa (Vice Chancellor of VTU). LEAD Prayana participants began its third day of the journey full of energy. They did Yoga under the guidance of Dr. Ramaswamy (Executive Director of Shri Patanjali Yoga Shikshana Samiti). The students also visited Siddaganga Math and were blessed by Sree Sree Sree Shivkumar Swamiji. They also participated in community activities at the Math. Later, in the evening students interacted with Director of SIT,Tumkur, Dr. M.N. Channabasappa . 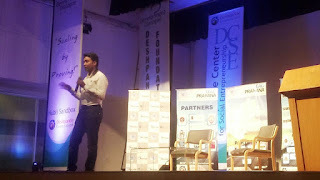 He spoke about the market scenario for the engineering students. The fourth day of Prayana began with celebration of 65th Republic Day at SIT Tumkur. Director of SIT, Tumkur, hosted the National flag and spoke about the importance of constitution in a democratic country like India. After the celebration, the participants of Prayana moved towards Mavenahalli near Dodballapur where they met real life example of ''simple living and high thinking '' who is Dr. L. Narayan Reddy (National awardee of organic farming). The participants of LEAD Prayana visited the farm of Dr. Narayan Reddy at Mavenahalli and learnt the importance of organic farming and the harmful effects of using chemicals and pesticides in farming and crops production. The participants of LEAD Prayana arrived to Agastya International Foundation on Jan 27 to learn, explore and develop new perspective about their environment. During their two day stay at foundation which was on 27 and 28 of February. They created a high energy wave by working on science models and involving in community activities. The LEAD Prayana participants performed a street play in five villages of Kuppam; Mushtrahalli, Kothapalli, Dhonimadgu grama, Kamasamudra and Bangarpeth and created awareness about dowry, child marriage and superstitions. The participants also involved themselves in several community leadership activities like plantation of saplings and painting a bus stand at Salachinthanapalli. The LEAD Prayana participants spent their 7th day of Prayana journey at Bangalore with Rajinish Menon, Director of Microsoft Ventures and Team Indus. They also interacted with Ramji Raghavan, Founder of Agastya International Foundation. The director of Microsoft ventures interacted with participants and shared life incident which caused him to achieve great heights. Students were inspired by the unique dream of Team Indus and their dedication towards it. Later in the day, students interacted with the founder of Agastya International Foundation, Ramji Raghavan and learnt lessons on how a person can follow his dream and passion to achieve what he wants and leaving very high profile job in foreign country. Participants began their day at S-VYASA with a session by Pro vice Chancellor of S-VYASA, Dr. H. Nagendra. He spoke about the importance of Yoga in daily life and advantages of practicing it. After the short visit to University campus, Prayana team began their journey towards Infosys, Mysore. At Infosys Mysore, the participants spent their day at Infosys Centre of Learning. The students were marveled at the brilliant architecture and the hard work that was put in to bringing a beautiful campus of 337 acres which trains 14000 employees. Along with the campus visit, students were given a session on leadership qualities by Mr. Sundar K, Senior Lead Principal of Education and Training Unit. Participants of Prayana were fascinated by the holy town of Dharmasthala. The cleanliness, rural development programs, sewage treatment, organic farming, waste management are followed through SKDRDP and SIRI programs at Dharmasthala. 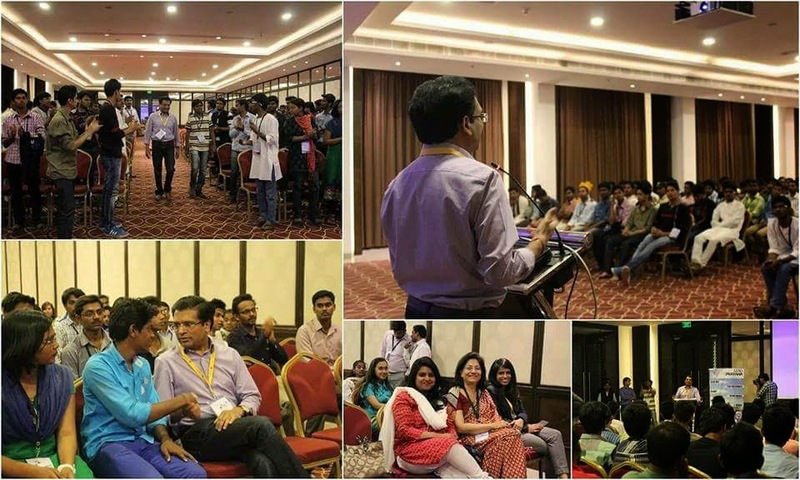 The participants of LEAD Prayana 2015 were inspired. They also interacted with the man behind the success of Dharmasthala activities, Dr. D. Veerendra Heggade. On the eleventh day of the Prayana, LEAD Prayana participants had an educational tour to Kalbhavi cashew nut industry at Mangalore. Students saw nanoPix Cashew Sorting Machine first-hand. While cashew sorting can be a lengthy process because of the need for visual inspection, the nanopic Cashew Sorting Machine relies on its ImageIn Technology to inspect the cashew nuts more quickly and efficiently. The students then engaged in a session with Sasi Sekar (Founder and CEO, nanoPix). He inspired the students with his advice to identify passion and channel it to become an entrepreneur. On twelth day of the journey with LEAD Prayana 2015, participants visited campus of Manipal University and interacted with Pro Vice Chancellor of Manipal University, Dr. Vinod Bhat. He spoke about the great heights that Manipal University has reached recently. It is imparting education in all the fields including medical, management, hospitality, etc. On the same day they reached Hubli and attended session at Seven Beans, a popular hangout café in Hubli. Mr. Gautam Ostwal, the President of TiE Hubli addressed the gathering and spoke about starting up a business. He also spoke about the advantage of having good networks. Akshay Patra (world’s biggest kitchen) and Kalkeri Sangeet Vidyalaya (unique music school for rural kids) was the destination of LEAD Prayana on their 13th day of journey. The participants learnt about the functioning and operation of Akshay Patra kitchen and interacted with Pramod Swamiji. Pramod Swamiji spoke about the history of Akshay Patra and how it is serving food to 9000 schools and thus covering 8 lakh students. Later in the day, the participants had a pleasurable experience of exploring the campus of Kalkeri Sangeet Vidyalaya and interacted with the students. LEAD Prayana participants 2015 interacted with Mr. Gururaj Deshpande and Mrs. Jaishree Deshpande in the morning on 14th day of their journey. Gururaj Deshpande advised students to concentrate on their health and develop the habit of yoga every day. He said that - without health you cannot achieve much. So do not ignore health. Later in the day, the participants interacted with Gaurav Shah, founder of seven beans and Shravani, co-founder of safe hands 24x7. The morning started off with a morning session with Suhas Gopinath, CEO of GlobalsInc. The students also interacted with Rashmi Bansal, Kailash Satyarthi and N R Narayana Murthy. They shared their life story and motivated students to dream big and work hard. the students participated in the YUVA Summit, rally held to create awareness against child labour. The rally was held from Deshpande Foundation till The Taj Gateway, Hubli and it was surprised for the participants of Prayana to see Mr. Kailash Satyarthi, Mr. Narayana Murthy, Dr. Gururaj Deshpande and thousands of guest and youth accompanying with them on the rally against child labour. 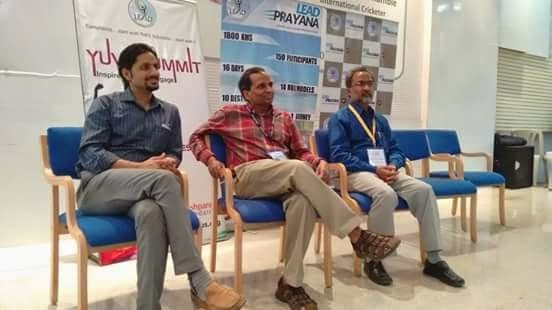 The last day of the Prayana was spent interacting with entrepreneurs Mr. Phanindra Sama (founder of redbus.in), Mr. Raju Reddy (founder of Sierra Atlantic) and Mr. Anshu Gupta (Founder of Goonj). They had their last Prayana dinner at hotel Taj Gateway and bid farewell to each other with a heavy heart and lot of live experience and bounding with each other. That's really awesome blog because i found there lot of valuable Information and i am very glad that you share this blog with us. Lead Management Software.